Guardian enables you to exempt specific computers from any web filtering. 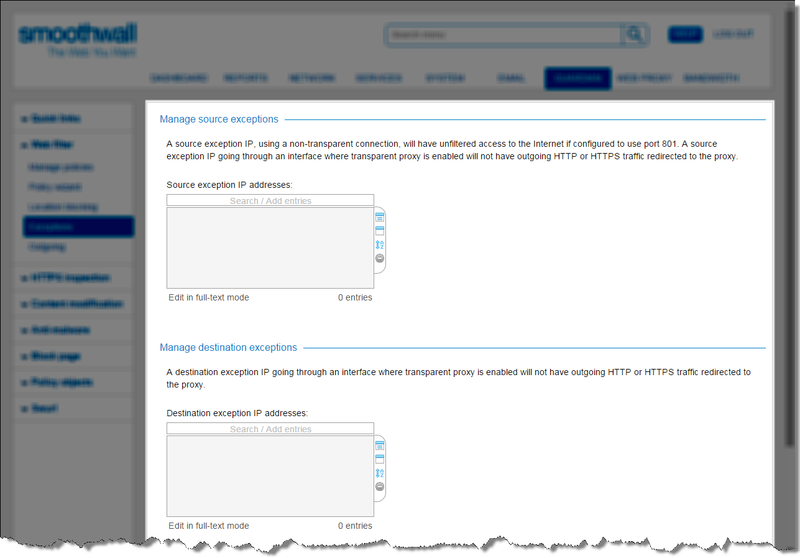 You can configure exceptions based on the source IP address or the destination IP address. A source exception IP using a non-transparent connection will have unfiltered access to the Internet if configured to use port 801. A source exception IP going through an interface where transparent proxy is enabled will not have outgoing HTTP or HTTPS traffic redirected to Guardian. A source exception IP using a transparent connection requires no client browser configuration. 1. Go to the Guardian > Web filter > Exceptions page. 2. In the Manage source exceptions area, enter the IP addresses, IP ranges or IP addresses with CIDR notation of the computers to be exempted and click Save. Guardian exempts the computer(s) from any web filtering. A destination exception IP which goes through an interface where transparent proxy is enabled will not have outgoing HTTP or HTTPS traffic redirected to Guardian. 2. In the Manage destination exceptions area, enter the IP addresses, IP ranges or IP addresses with CIDR notation of the computers to be exempted and click Save. Guardian exempts the computer(s) from any web filtering.